Some of you asked about the sock sweater that I mentioned in the blog. The patterns can be found in the Winter 2008 issue of knitters mag. This is a very easy top down sweater that comes in a good range of sizes. It calls for around 1200 yds each of two sock yarns held together(2400 yds al together). We were first told that you could use any sock yarn as long as both are the same kind ie: 2 berroco sox or 2 malabrigo, however this is not neccesary. If you use 2 different sock yarns, though, and one is thicker than the other, that yarn will be predominate. We have a sample of the sweater in the shop if you want to see it. This Sat the Lace knitting group will meet at mass. ave. from 12-3. There is no cost. Bring an existing project or check out some of our new lace yarns. Classic elite yarns are in, as well as Crystal Palace Mochi Plus and the NEW Chunky Mochi! 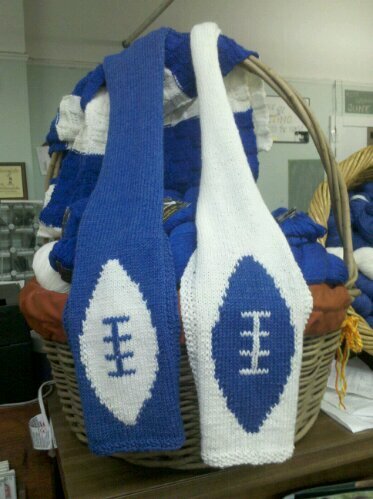 Were you so impressed with my photo of the super bowl scarf on the blog!!! I am. Thanks Chris. More to follow (you are just lucky I have no animals!). Here is a photo of the shop pattern. You can pick it up the next time you are in the shop. There is no charge for the pattern, but we ask that you come in to get it. Who says mondays are bad? Madelintosh sock yarn came in today! There are 31 colors in stock! Come and get it! Also we got in more of the Dream in Color Knitosophy! This sock yarn is individually dyed, so each colorway uses the same colors, but in different amounts and intensities. One slein will do a pair of socks, but some people are using it for the sock cardigan. It is fab. because it shades in the sweater! Cascade is also here! HELP! I really don’t know where to put it all!